This journal was made to order as a present for a retired doctor. There is a double buckle clasp and the caduceus on the cover was dapped out on dap bag and then riveted to the cover with #12 copper wire rivets. The cover was colored with a torch and then sealed to retain the finish. A nice brown leather was stitched on and the signatures were sewn in using a red waxed linen thread. 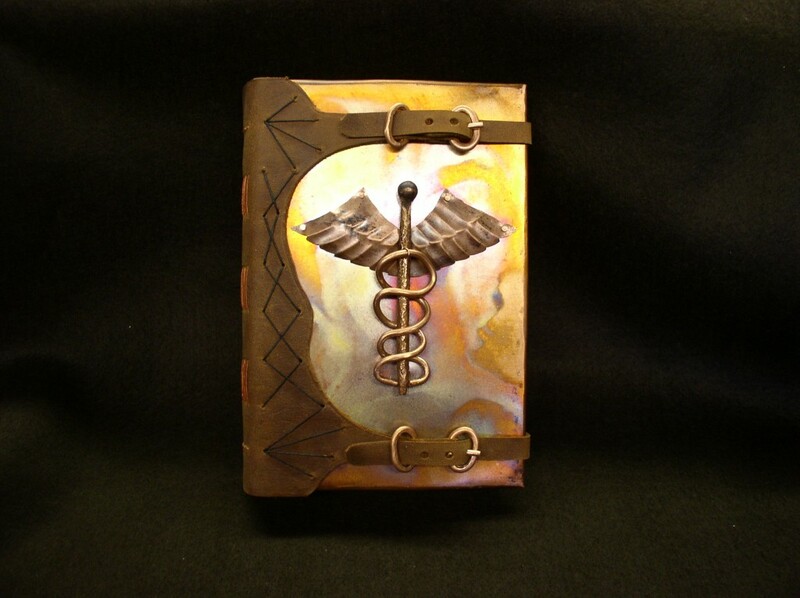 Author Bdb551Posted on March 16, 2016 March 16, 2016 Tags caduceus, copper, dap bag, dapped, double buckle clasp, leather, linen, rivets, signatures, stitched, thread, torchLeave a comment on Custom copper and leather journal, “Doctore”.